In 2015 Nando’s announced plans for an ambitious expansion of its Huddersfield restaurant increasing its size by nearly 50 percent. 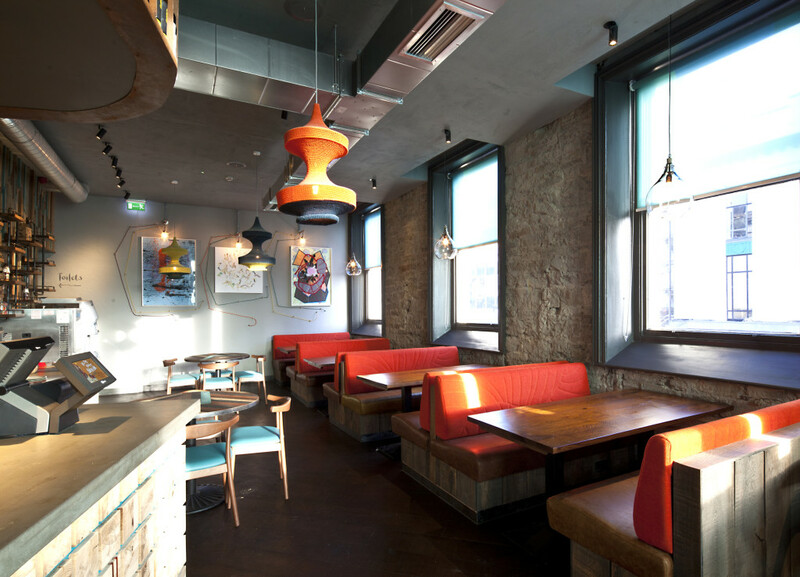 Being situated in a Grade 2 listed building could present certain challenges to an interior design team – how to model the bright and stunning interiors for which Nando’s is renowned while complementing the building’s historic character? Given the buildings listed status Nando’s and B3 assured the local planning department that the restaurant would be revamped sympathetically. With approval granted the restaurant expanded to encompass a new first floor dining area accessed by a spiral staircase plus new booths downstairs and a lobby area to protect diners from the wind when the main entrance doors were open. 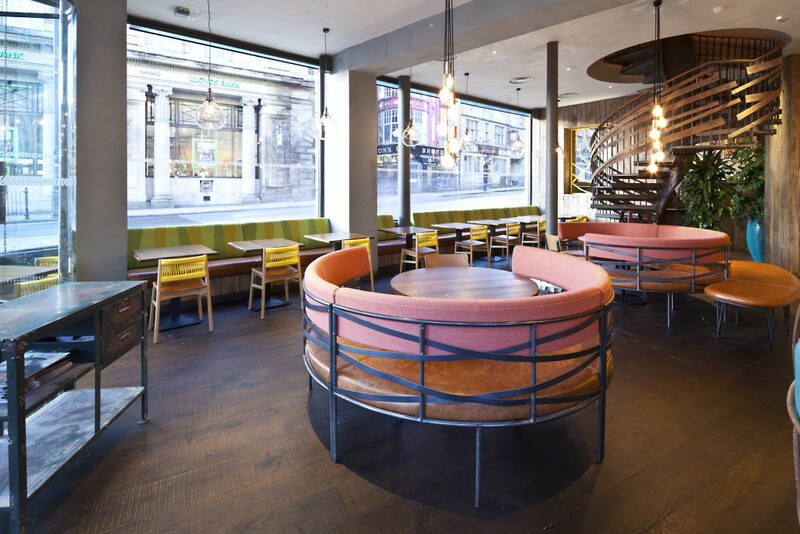 In an imaginative twist the designers used Craftwood’s circular booths shown above in a vibrant zigzag patterned blue, set within the curving lines of metal frame structures by others to draw the attention of customers visiting the restyled ground floor area. This view of some other ground floor circular booths illustrates the woven steel strap detail to the backs of the seating frames. The circular theme is continued in the spiral staircase, seen in the background, leading to the upper level addition to the restaurant. 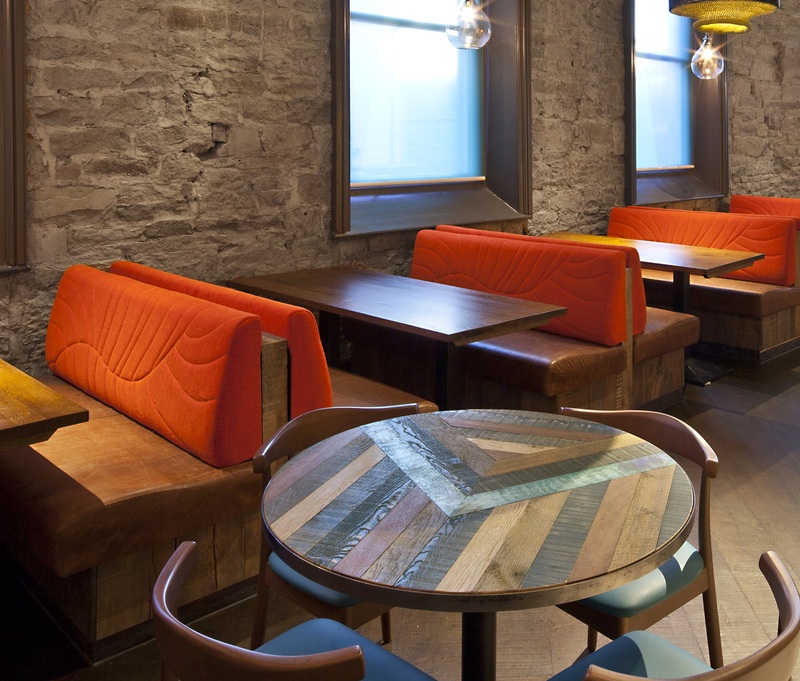 On the new first floor an unusual custom stitch pattern is used on the vibrantly coloured seat backs…….adding a real wow to the seating booths. In an interesting use of fabrics, B3 Designers achieved the look they wanted for this seating by having alternating sections of three separate fabrics stitched together (rather than settle for a single multi-patterned fabric). A rather unique idea that Craftwood was ably equipped to realise. 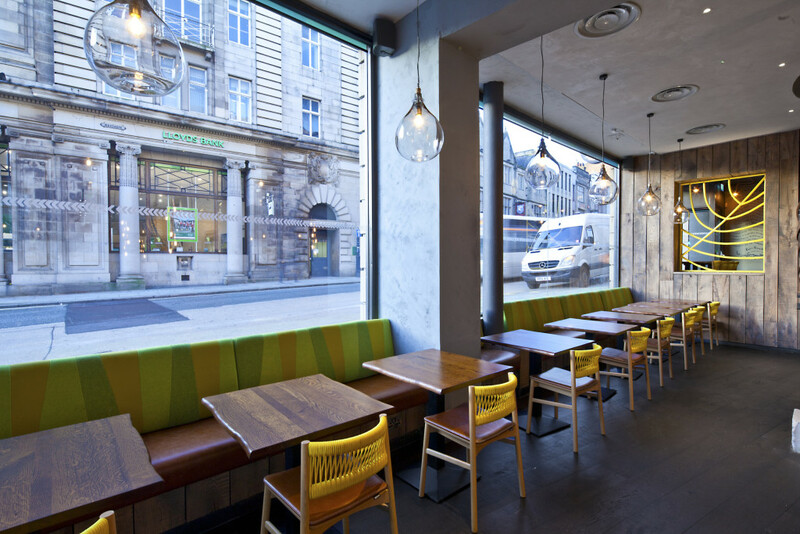 “Nando’s Lovers Rejoice,” said the pages of the local newspaper reporting the expansion of Nando’s Huddersfield, reflecting the enthusiasm of chicken lovers and Nando’s aficionados in particular at the prospect of a greatly enlarged restaurant. “Rejoice!” could just as equally describe reaction to the new-look interior created here by B3. Existing customers found the new upstairs dining area a novel experience while reviewers on Trip Advisor have been commenting favourably on the decor of the newly renovated and improved restaurant while the extra capacity is certainly appreciated by diners. 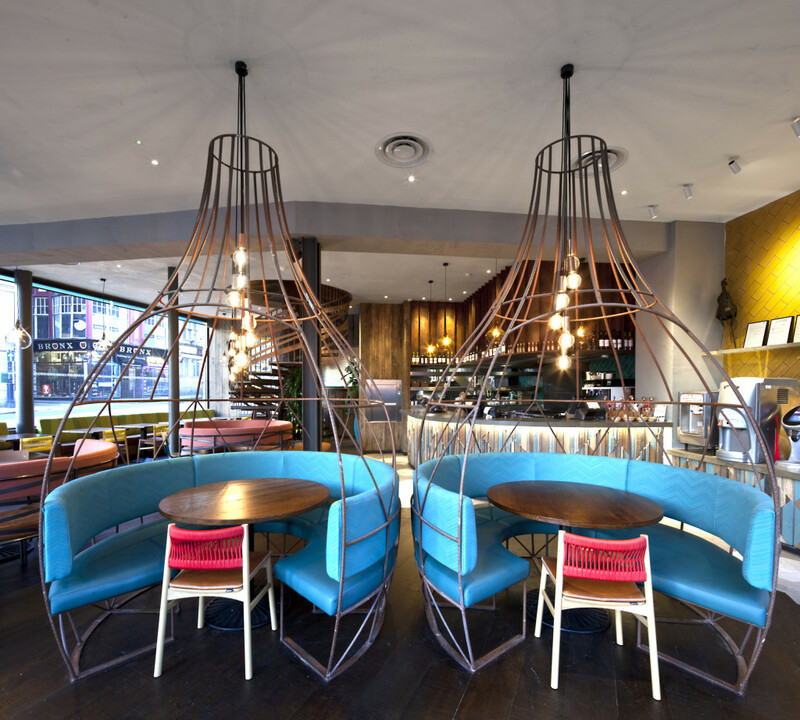 All-in-all then the collaboration between Nando’s, B3 Designers , DRC Property and Craftwood appears to have been a resounding success.